Squirrel Point Light is a lighthouse in Arrowsic on the Kennebec River, Maine. It was established in 1898, fifteen years after the founding of the Bath Iron Works, a major shipbuilder, five miles further upriver. 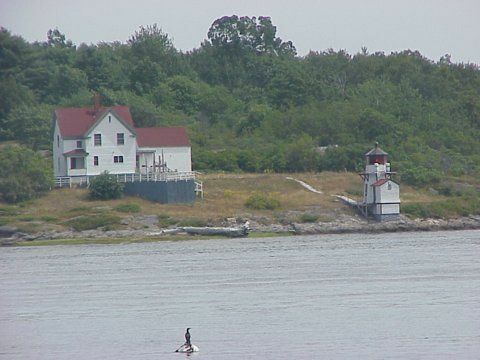 It was part of a major upgrade of the river's lights — the Doubling Point Light and the separate Range Lights on the point, Perkins Island Light, and Squirrel Point Light were all built at the same time. Squirrel Point Light was listed on the National Register of Historic Places as "Squirrel Point Light Station" on January 21, 1988. From Brunswick take Route 1 north into Bath. Take the Western Ave/Richardson St. exit to Route 209. Take a right onto Route 209. Stay on Route 209 for 6.7 miles into Phippsburg. Take a left onto Parker Head Road. About 1/2 mile down the road there will be a clearing on your left. You'll see the Kennebec River and the lighthouse on the far shore.